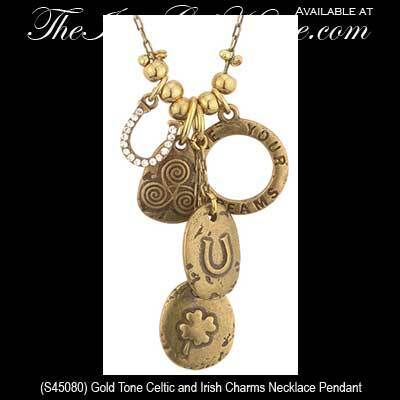 Celtic necklace features lucky charms that include a gold tone spiral along with a horseshoe and clover. This Irish necklace, like all the Irish made jewelry at The Irish Gift House, is nickel free and hypoallergenic. This retro style Celtic necklace features gold tone lucky charms that include a horseshoe along with a clover and a spiral. The widest charm is 5/8" and the pendant is 1 3/4" tall, and includes an 16" chain with lobster claw catch and 2" long extender. The pendant is made by Solvar Jewelry in Dublin, Ireland and it is gift boxed with a Celtic spiral history card, complements of The Irish Gift House. The Circle Charm Says, "Live Your Dreams".